What value could I insert into a bit type column? I am trying to insert or edit the bit value to "0" or "1", but either returns me a blank. Could someone tells me how to insert the value in it? How do you create a yes/no boolean field in SQL server? Your issue is in PHPMyAdmin itself. Some versions do not display the value of bit columns, even though you did set it correctly. Not the answer you're looking for? Browse other questions tagged mysql sql boolean bit or ask your own question. 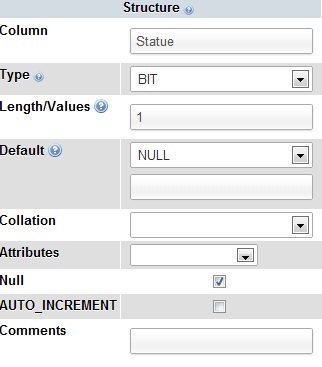 Mysql: How to query a column whose type is bit?